Qubit is pleased to present Binocular Rivalry, an immersive light and moving-image installation by Bernhard Fasenfest. Binocular Rivalry fills the sprawling 6000 square feet of Project-Q’s exhibition space with luminous grids of cascading light, tactile environments, textural fabric projections, and other works that explore the multimodal capacity of expanded cinema. The installation encourages viewers to engage in embodied cognition, moving in and around projected architectures and objects, navigating real and imagined topographies, and exploring unfamiliar perceptual environments. Drawing upon traditions of structural filmmaking as well as cutting-edge concepts of modern psychophysics, the mesmerizing sensory experiences of Binocular Rivalry invites the spectator to take an active role not only in understanding the processes of mediated perception but also in creating their own unique aesthetic experiences. The phenomenon of binocular rivalry in neuroscience occurs at the boundaries of normal visual perception: when radically different images are presented to each eye, the visual system, struggling to fuse together a three-dimensional view of the world, becomes unstable. Vision oscillates in seemingly random intervals between the images, sometimes fusing them into bizarre hybrids and patterns. In this way rivalry is both a revealing lapse in normal perception, making apparent the usually invisible inner workings of stereo vision to conscious perception, and a form of synthesis, in which the brain creates novel perceptions out of an estranged encounter with real stimuli. The exhibition engages with this idea of analysis through synthesis, bringing spectators into extraordinary experiences that engender new modes of perception. The viewer enters Binocular Rivalry through Parallax Barrier, a light environment in which a single video slices through layers of hanging fabric. The projection is at once a solid swath of light and a continuum of moving images flowing across layers of fabric, the viewer, and other viewers. The viewer’s perception and the fabric planes themselves—each a different surface, transparency, shape, size, and point in space, some at rest and others in motion—produce new versions of the video work. As the viewer moves around and activates the piece, the projection distorts, converges, and forms a shimmering matrix of images.Parallax Barrier opens onto Field of Vision, a sculpture garden of mixed media works. Where Parallax Barrier engulfs the viewer, Field of Vision retreats and reveals unusual, reified forms of light. The viewer wanders through the piece and encounters sculptures—draped, transparent, reflective, and patterned objects illuminated by still and moving projections canted at their surfaces from unfamiliar angles. Light and surface become inextricably fused in these pieces, their scale and strangeness heralding the synthesis of an entirely new form.The exhibition is dotted by looped single-channel video works that use scale to expand traditional viewing experiences and the relationship of the body to visual perception. Among them, Sustain Release, adheres to a familiar format—a video projected onto a flat screen flanked by seats for viewing—but employs haptic feedback, direct contact with viewers, to push past the boundaries of a visual field. The video component overwhelms the viewer with expanded topologies of dancers’ rippling skin and musculature. These familiar moments of tension and release alone elicit a sympathetic, bodily response from their viewers. The haptic elements intensify this visceral effect, as the viewer becomes a corporeal mirror for the illuminated bodies. Other single-channel video works include Between Our Selves, a 3D film in which portraits are sorted by gender and mapped to each eye, inducing a binocular rivalry effect in which they are actively fused in the mind of the spectator, creating a fluid gender continuum; Buckets of Rain, a quick-footed dance of light, shadow and color in magnified aqueous surfaces; and Speaking and Listening, an ethnographic study of gestural linguistics and techniques of the body, among others. The short work of the American filmmaker Bernhard Fasenfest ranges across many genres and techniques— flicker films, live-action anthropological investigations, found-footage compilations, dizzying abstract studies and carefully ordered sequences of stills, one per frame—yet still seems possessed of a single, unified vision. 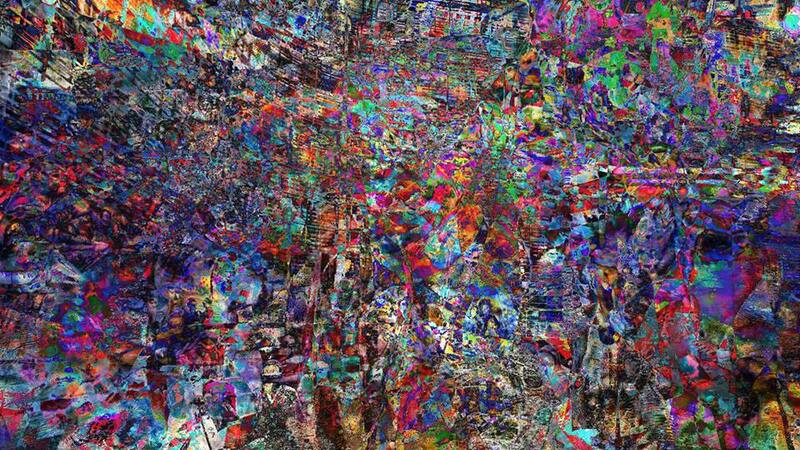 Fasenfest’s project is, on one level, to channel the spirit of American avant-garde cinema’s twentieth century icons—Brakhage, Sharits, Smith, Cornell—through the lens of twenty-first century technology. On another level, it’s to blur the boundaries between the senses (sight, sound, touch, etc), and other distinctions besides: the theater and the gallery, two- and three-dimensional space, camera eye and human eye. Fasenfest’s filmography currently includes over 50 shorts and multi-media works. He lives and works in New York City. Qubit is a contemporary music and performance art initiative founded in 2010 by Alec Hall and Bryan Jacobs.Its principal mission is to foster the development of emergent voices by working with young composers whose work has yet to reach wide audiences, and to explore and develop new and experimental technologies as they relate to performance practice, sonic aesthetics, and public engagement. Establishing theintegration of cutting-edge digital technologies as its core goal, Qubit challenges conventionalcuratorial practices to engage audiences in captivating methods that fully express the creative possibilities of the 21st century. Please join us for the opening on Friday August 24th from 7-9pm with a screening to follow at 9pm. A special press preview of limited works will take place on the weekend of August 17th. The exhibition will be on view from Friday August 24th through Sunday August 26th. Screenings and performances—exact times to be announced—will be held throughout the weekend.